Hello Readers, I am again back after a long break. This time I present you the extremely elegant social subscribe widget which you can add in the footer of your blogger blog posts. This widget showcased Facebook, Twitter and Feedburner integration. This widget has been optimized for blogs with smaller width too and looks perfect on all blogs. The widget uses Jquery, CSS and HTML for its working. You can see the live demo of this widget below itself. Make sure to check the like button if it works and give us some likes for our Facebook Page. First and foremost you need to add the code. First go to Blog Title → Template → Edit HTML. Press Ctrl. + F and search for <data:post.body/> code in your template and paste the below given code just below <data:post.body/>. NOTE : There maybe more than one (usually 2-4) <data:post.body/> so make sure that you have selected the right one. If the widget does not appear try changing the location of code. After adding the above given code, you need to make some necessary changes for changing the user IDs. In the above code I have made 6 words in bold and blue, you need to change them as required. The first two are for Facebook Username, the third and fourth for Twitter handle and the last two are for Feedburner ID. After making these changes you just need to Save your Template. 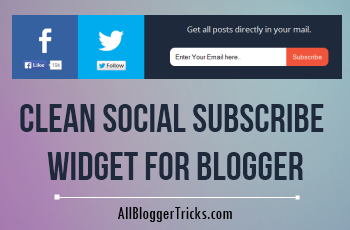 Thats it, the clean social subscribe widget on your blogger blog is live and ready to attract your users. Cheers! Hi dhiraj, this is nice and decent, there is something I want to say but not in public, could you put your mail do I can send my queries to you. That's really nice and clean Social Subscribe widget. Thank you very much for this nice share. Have always been terrified to edit thing related to html on the blog template as I am afraid it will mess up the whole blog layout. But after reading your post with clear instructions, will definitely give it a try. Any tips on adding drop down menus? But Currenly I use GetSiteControl (http://bit.ly/1HE30nT) it includes share, subscribe and more, it has nice reporting option so on I loved it. Awesome brother. It is great. Terima kasih sudah berbagi ilmu keren ini! Thanks ABT ! This is totally awesome. Ii integrated it on my site and my blogs even more better, elegant and super . Check Here and Subscribe for more Tech Updates, Gadgets, Smartphone and more . Thanks for sharing bro! very good article! Cool! thanks a lot for sharing this. This Blogs also done with codiblog help and tips. Great bro! it awesome for my blog. Thanks for sharing! That's really nice and clean Social Subscribe widget. Thank you very much for this nice share. Thanks Again.